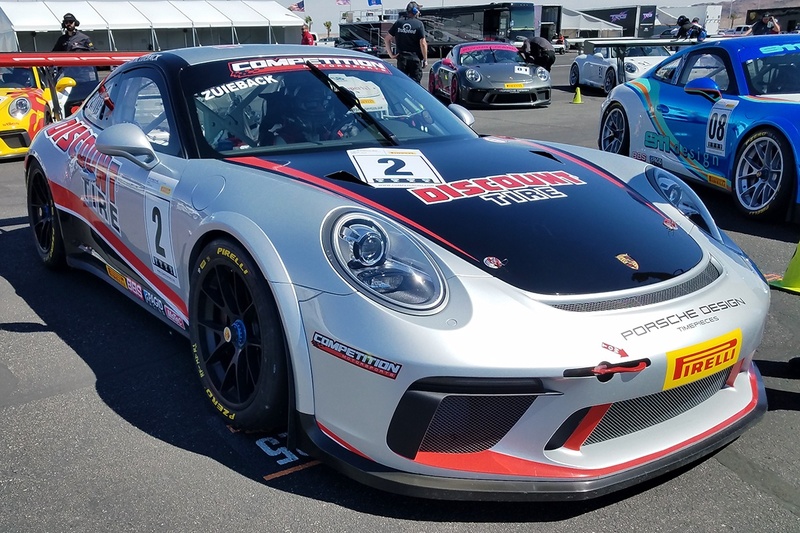 LAS VEGAS – Competition Motorsports’ Michael Zuieback and teammate Sean McAlister took the overall victories in the two races that comprised Round 1 of the Pirelli Trophy West USA series on a very windy Saturday on the road course at Las Vegas Motor Speedway. 33 cars in six Porsche classes contested the first races of the season: Diamond and Diamond Masters (2017-2018 991.2 GT3 Cup), Platinum (2015-16 991.1 GT3 Cup), Gold (2010-2013 997.2 GT3 Cup), Silver (Cayman Clubsport GT4 MR) and Bronze (2016 Cayman Clubsport GT4 Trophy) classes. Given the size of the field, organizers altered the race group split: for this event only, the Diamond Classes raced together, with Platinum, Gold, Silver and Bronze competing in a separate race. At subsequent Pirelli Trophy West events, classes will be split by 911 GT3 Cup Cars and Cayman Clubsport GT4 cars. Despite winds gusting over 30 mph across the Nevada desert, the competitors enjoyed two caution-free 20-lap races highlighted by numerous passes and race-long battles. In the Diamond Class event, 2017 Diamond Class champion Loren Beggs in the No. 08, 911 Design, 991 GT3 Cup Car to lead the field to the green flag. Beggs got a solid jump at the start but Diamond Masters competitor Michael Zuieback, driving the No. 2 Porsche for Bob Faieta’s Southern California-based Competition Motorsports, kept the pressure on, reeling him in as the early laps progressed. Zuieback set up Beggs on the front straight, dove to the inside and made the move stick, taking the lead on the inside of Turn 1 on Lap 6, with Beggs pulling into pit lane at the end of the lap with a punctured right rear tire. Zuieback took the checkered flag with a whopping 38-second lead over his teammate and fellow Masters class entrant Mike McAlister. 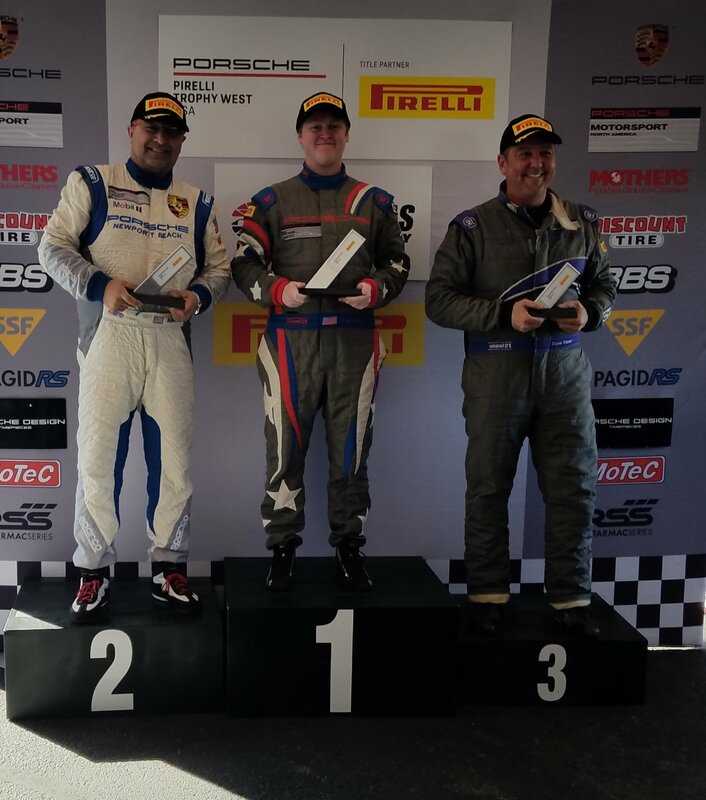 Jonah Yokubaitis, driving for TruSpeed AutoSport in his first Porsche race, came back from early contact with McAlister to take the Diamond Class win and third position overall ahead of Beggs. 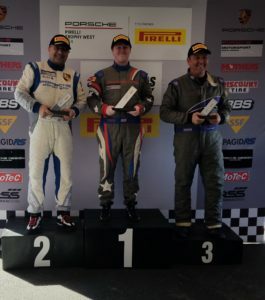 In the second race, Sean McAlister, moving up from the Silver Class this season to the Platinum Class, put his No.00 Competition Motorsports, 991.1 GT3 Cup Car on the pole and after an early battle with 2016 champion Ray Shahi, pulled away from the field to take the victory – and the chance to view traffic from a different perspective. Teammates Chris Bellomo and Jim Rappaport, driving for The Racer’s Group, battled between themselves for the Silver Class victory, with Bellomo, driving the No. 67 Cayman GT4 MR, making the move on his teammate on Lap 14 and holding the advantage to the checkered flag. All eyes were on the Bronze Class battle, with Laura Ely starting just ahead of Competition Motorsports’ Carl Tofflemire. Tofflemire made his move at the start, with Ely falling into the clutches of several Platinum Class competitors and working to fight her way back to the lead. Tofflemire kept his eye on his mirrors for the final four laps and took the victory, with Ely right behind battling nose-to-tail in hard, close, clean competition.